The Nietzsche Channel: Nietzsche: Poems / Gedichte. This selection of Friedrich Nietzsche's poetry contains translations by The Nietzsche Channel.  Schweifen, o Schweifen!  To roam, O to roam!  "Noch einmal, eh ich weiterziehe"  "Once more, ere I move on"
 "In Basel steh ich unverzagt ..."  "In Basel, I stood undaunted ..."
 "Freundin!sprach Columbus ..."  "Friend!spoke Columbus ..."
 "Dies ist kein Buch: ..."  "This is no book: ..."
 "Die fröhliche Wissenschaft."  "The Joyful Science."  Der "ächte Deutsche."  The "True German." Schulpforta was the elite boarding-school to which Nietzsche gained admission. On September 29, 1858, he left the Naumburg Domgymnasium just prior to his second term of Untertertia after receiving a scholarship from the Landesschule Pforta. Nietzsche's gymnasium grades were mediocre, except in religion. However, his deceased father had been an employee of the state, and it was not uncommon for their children to receive admission to Pforta upon a satisfactory examination. Poor results on his Pforta entrance exam set Nietzsche back a year. See Thomas Brobjer, "Why did Nietzsche Receive a Scholarship to Study at Schulpforta?" In: Nietzsche-Studien (2001) 30:322-28. Das ist mir die Pforte dort. Deckt weißlicher Nebel still zu. Und blicken friedlich uns an. Of them to me is Pforta. A gentle reminder to rest. Why am I drawn to the same place? That's something I don't understand. Translation © The Nietzsche Channel. In: Friedrich Nietzsche in Words and Pictures. Part 2. Nietzsche's School Years and Military Service: 1858-68. Forthcoming. Nietzsche started feeling homesick at Schulpforta, realizing, more than ever, that since his father's death he had been a "homeless" boy, untethered from the world. On July 28, 1862, Nietzsche sent prose, poetry (including this poem), and his photograph along with a letter to his friend and classmate at Schulpforta, Raimund Granier (1843-1909). The 1862 photograph  now owned by The Nietzsche Channel  and poem were published together in "Jugendporträt und Jugendgedicht Friedrich Nietzsches." Der Welt-Spiegel. No. 94, November 23, 1902, 1. An explanation of the photograph and poem was published the following day in Der Zeitgeist, another supplement to the Berliner Tageblatt. See Friedrich Dernburg, "Neues aus Nietzsches Jugend. Unbekannte Verse und Entwürfe Friedrich Nietzsches." Der Zeitgeist. No. 47, November 24, 1902, 1f. The other items Nietzsche sent to Granier included "Euphorion"  fragments of a novel written while on vacation in Gorenzen. See "Euphorion. Chap. I." In: Nietzsche's Writings as a Student. The Nietzsche Channel, 2012, 75-78. Lastly, "Schweifen, o Schweifen!" may have been influenced by Joseph von Eichendorff. Cf. the penultimate stanza of Eichendorff's "Die Nachtigallen." Klingt es so lieb, so lind. It sounds so soft, so gentle. Around me in the wind. It too will soon be forgotten. — "Mich seine Stimme wieder riefe" was originally in the second person: "Mich dein Stimme wieder riefe." — "Das Wort: Dem unbekannten Gotte:" was originally "Das Wort: Dem unbekannten (Worte:) Gotte:" but Nietzsche settled on the ending "Gotte:"
— "Sein bin ich, ob ich in der Frevler Rotte" was originally "Sein bin ich, ob ich ihn der Frevler Rotte": "ihn" was crossed out diagonally, either in its entirety, or just the "h". For further information, see: Karl Pestalozzi, "Nietzsches Gedicht 'Noch einmal eh ich weiter ziehe ...' auf dem Hintergrund seiner Jugendlyrik." In: Nietzsche-Studien. Bd. 13. Berlin, New York 1984, 101-110. Cf. Chira Conterno, "Nietzsches 'Dem unbekannten Gott.'" In: Christian Benne, Claus Zittel (eds. ), Nietzsche und die Lyrik. Ein Compendium. Stuttgart: Metzler, 2017, 78-88. His voice would summon me again. das Wort: Dem unbekannten Gotte. The words: To the Unknown God. Still force me into his service. You incomprehensible one, akin to me! I want to know you, even serve you. Under the veneer of respectability, Nietzsche still feels somewhat like a lonely outcast, but starts to gain his confidence when he receives his appointment to the University of Basel. This dedicatory poem appeared in copies of his inaugural lecture at Basel, delivered on May 28, 1869 under the title Über die Persönlichkeit Homers (On the Personality of Homer), and subsequently published as Homer und die klassische Philologie (Homer and Classical Philology). Doch einsam daGott sei's geklagt. Und schrei ich laut: Homer! Homer! So macht das Jedermann Beschwer. And I cried out: Homer! Homer! And laugh at the loud crier. Und ist geduldig still dabei. And is quietly patient withal. Of kindness here is my printed thanks. Translation by The Nietzsche Channel © 2010. 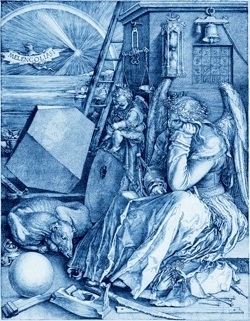 In November 1869, Cosima Wagner asked Nietzsche to help her obtain a Christmas present, a print of Albrecht Dürer's Melancolia 1 (1514), for Richard Wagner (who was fond of Dürer's works). Nietzsche bought a copy for her in June 1870. This poem was composed in Gimmelwald in 1871, when Nietzsche was on vacation with his sister and his friend Carl von Gersdorff. For further information, see Christoph Landerer, Marc-Oliver Schuster, "'Begehrlich schrie der Geyer in das Thal.' Zu einem Motiv früher Wagner-Entfremdung in Nietzsches Nachlaß." In: Nietzsche-Studien (2005) 34:246-55. Sit hermitlike on a tree stump, hewn. Dreaming of its staked and rotting carrion. So mumienhaft auf meinem Klotze ruhte! I rested mummylike on my seat! Blissfully proud in the morning heat. Through its glinting yawning abyss. Penance for the youthful years of life! Truthfully, yet with an austere face. Daring me to deny you amid the rumbling avalanche. Qualvolle Gier, sich Leben zu erzwingen! Driven by agonizing greed, she sighs! Yearns for the caress of butterflies. What I thirst afterfor life, life, life! Dass ich mit Reimen zierlich dich umflechte. That you, with delicate rhymes, I adorn. As you dawn, an evil face is born. Now leave me, goddesslet me go!  Translation by The Nietzsche Channel © 2001. Another poem inspired by Albrecht Dürer's Melancolia 1 (1514), and also composed in 1871 while on vacation in Gimmelwald. Trübe Göttin, um mein Fenster hin. To a roaring brook's angry sound. Your death-drink, sorceress, was brewed! And spoke: "Now hear what I am! The victress and the tigress, equally! Gifte denkt mein Hirnnun kniee! Bete! Now kneel, wormpray! Or melt in my mad glow!" und ruht bei jedem Schritte. Dies ist der Herbst.  This is the autumn. And rests with every step.  Translation by The Nietzsche Channel © 2018. This initial draft of Nietzsche's 1884 poem "Am Gletscher" (On the Glacier) was written while Nietzsche was on sabbatical in Rosenlaui in 1877 (see Nachlass, Frühling-Sommer 1877 22.) The preliminary title was "Sommer im Hochgebirge" (Summer in the High Mountains). Its subject is a sick young boy whom Nietzsche encountered on his walks to the Rosenlaui glacier. Nietzsche consoled the child, who eventually succumbed to his illness. For Elisabeth Förster-Nietzsche's account of Nietzsche and the sick boy, see Der einsame Nietzsche. Leipzig: Kröner, 1922, 33. English translation in Elisabeth Förster-Nietzsche, Paul V. Cohn (trans. ), The Lonely Nietzsche. New York: Sturgis and Walton, 1915, 23. Cf. Sander L. Gilman, Begegnungen mit Nietzsche. 2. Aufl. Bonn: Bouvier, 1985, 342. Und steht als weisse Säule horchend da. But we only see the reply. And stands there listening like a white pillar. Who will explain it to you? Lauf' ich schon, wo lauf' ich hin? I already run, where do I run? Do I jump in the waves? Fluch der Bildung, wenn sie speit! Trägt nicht Gold im Munde. Curse the culture, when she spews! Curse the league of virtues! Doesn't wear gold in her mouth.  Translation by The Nietzsche Channel © 2016. Trust in a Genoese no more! Is lured out there too far. Fremdestes ist nun mir teuer! Herz, bleib kalt! Hand, halt das Steuer! Vor mir Meerund Land?und Land?  The strange is now dear to me! Stay cold, heart! Hold the helm, hand! Stehen fest wir auf den Füssen! Uns Ein Tod, Ein Ruhm, Ein Glück! We stand fast on our feet! Us with death, glory, fortune! Dies ist kein Buch: was liegt an Büchern! Was liegt an Särgen und Leichentüchern! Es lacht das Meer, das Ungeheuer  This is no book: what do books matter! What do coffins and shrouds matter!  Translation by The Nietzsche Channel © 2009. An diesen Särgen und Leichentüchern! This is no book: what do books matter! To these coffins and shrouds! Yet within lives an eternal present. Mir fortan und meinem Griff! Trust in myself and my grip! Und was es thutdas Wort ergetzt. Bald krank und aber bald genesen. Von Tod und Sterben mißgehandelt. And what it doesthe word delights. At once sick and yet soon recovered. Maltreated by death and dying. That put big and tiny words to death!  Translation by The Nietzsche Channel © 2003. Now when I speakno one speaks with me at all. I wait: on what do I wait only? I wait on the first lightning.  Translation by The Nietzsche Channel © 2000. March 14, 1883: a poem dedicated to the composer August Bungert, on the occasion of his birthday and written in a copy of Morgenröte (Dawn). Must for a long time  be a cloud.  Translation by The Nietzsche Channel © 2010. A poem written in a letter to Resa von Schirnhofer at the end of November 1884. Geht die Welt nicht schief und schiefer? Und die Deutschen  täglich flacher. Isn't the world getting more and more crooked? And the Germans  daily flatter.  Translation by The Nietzsche Channel © 2014. Earlier titles for this poem were: "Der Barde spricht" and "Yorick unter Deutschen" ("The Bard Speaks" and "Yorick Among Germans"). Nietzsche's inspiration was the French writer Stendhal. His source was probably Stendhal, or perhaps Paul Bourget. See Stendhal, Promenades dans Rome. Vol. 2. Paris: Lévy, 1853, 233: "Vengo adesso di Cosmopoli. / (Vous voyez en moi un véritable cosmopolite.)" (You see in me a true cosmopolitan.) Stendhal used this loose quotation of a line from an opéra bouffe, and adopted it as his motto. Also in Stendhal, Rome, Naples et Florence. Paris: Lévy, 1854, 67: "vengo adesso di cosmopoli." Cf. Paul Bourget, "Psychologie Contemporaine. Notes et Portraits: Stendhal (Henri Beyle). [III. Le Cosmopolitisme de Beyle.]" In: La Nouvelle Revue. Tome dix-septiéme. Juillet-Août. Paris: 1882, 890-925 (911). The first line of the poem, "Ô peuple des meilleurs Tartuffes" (O people with the best Tartuffes), alludes to the hypocritical priest who is the eponymous hero of Molière's 1664 comedy. Ich bleibe dir treu, gewiß!" I remain true to you, there is no question!"  Translation by The Nietzsche Channel © 2019. Ach Vogel, was hast du gemacht! Not knowing where his path will lead. Then a bird sings through the night. "Oh, bird, what are you doing! The night is not beautiful to me when alone. And never, never stand still! Was that mein Flötenlied ihm an? "What has my flute song done to him? The poor, poor wandering man!" Translation © The Nietzsche Channel. In: Friedrich Nietzsche in Words and Pictures. Part 4. The Wandering Philosopher: 1879-1888. Forthcoming. Dies ist der Herbst: der — bricht dir noch das Herz! Er klagt ihr nach. This is the autumn: it — just breaks your heart! How the world became so withered! The wind plays its song. Dies ist der Herbst: der — bricht dir noch das Herz. Die Purpur-Wange deckt? — This is the autumn: it — just breaks your heart. Wer redet noch? — — You are silent, do not answer? — ich seh's, ich seh's — und sterbe so." — This is the autumn: it — just breaks your heart. Dies ist der Herbst: der—bricht dir noch das Herz! Fliege fort! fliege fort! This is the autumn: it — just breaks your heart! See explanatory note above for "Um Mittag, wenn ..."
Doch sehen wir sein Sprechen nur. But we only see his speech. Oh child, you know we dearly love you!" The boy with the weary, burning eyes. Happy is he who yethas a home! Schaust rückwärts ach! wie lange schon! Gazing backwards alas! for how long! Did you steal away into the world's winter? What you've lost, never stops anywhere. That always seeks colder skies. Your bleeding heart in ice and scorn! Woe betide he who has no home!" In's dumpfe deutsche Stuben-Glück! God have mercy!  Translation by The Nietzsche Channel © 2002. The poem, originally entitled, "Einsiedlers Sehnsucht" (Hermit's Longing), was written at the end of November 1884 and dedicated to Heinrich von Stein: "Dies ist für Sie, mein werther Freund, zur Erinnerung an Sils-Maria und zum Danke für Ihren Brief, einen solchen Brief!" (This is for you, my esteemed friend, in memory of Sils-Maria and in gratitude for your letter, such a letter!) Nietzsche made a few changes to the poem, including the title "Aus hohen Bergen" ("From High Mountains"), and used it as the "Aftersong" of Beyond Good and Evil. Oh Lebens Mittag! Feierliche Zeit! Wo bleibt ihr Freunde? Kommt! 's ist Zeit! 's ist Zeit! O noon of life! O time to celebrate! Where are you friends? Come! It's time! It's time! To look for you from the most distant bird's-eye view. So nahe, wer des Abgrunds grausten Fernen? Mein Reichwelch Reich hat weiter sich gereckt? To the grey yonder of the abyss? My realmwhat realm stretches further? Ihr zögert, stauntach, dass ihr lieber grolltet! Ichbin's nicht mehr? Vertauscht Hand, Schritt, Gesicht? You hesitate, amazedoh, you are quite sullen! Iam no longer the same? Hands, face, gait have changed? And what I am, to you friendsI am not? Ein Andrer ward ich? Und mir selber fremd? Ein Ringer, der zu oft sich selbst bezwungen? Durch eignen Sieg verwundet und gehemmt? Am I another? A stranger to myself? A wrestler, who too often subdued himself? Wounded and stopped by his own victory? Ich suchte, wo der Wind am schärfsten weht? Verlernte Mensch und Gott, Fluch und Gebet? Ward zum Gespenst, das über Gletscher geht? I sought where the most biting wind blows? Unlearned man and god, curse and prayer? Become a ghost who crosses glaciers? Hier muss man Jäger sein und gemsengleich.  My old friends! Now how pale you look! Full of love and fear! Here one has to be a hunter and chamois-like. Halt neuen Freunden deine Thüren offen! Die alten lass! Lass die Erinnerung! Keep your door open to new friends! Let the old go! Let the memories go! Once you were young, nowyou are younger! Die Liebe einst hineinschrieb, noch, die bleichen? Love once inscribed on it, the faded ones? Is afraid to grasp,like parchment that is discolored, burnt. Nothing but ghosts of friends!  O withered word, once fragrant as the rose! Oh Jugend-Sehnen, das sich missverstand! Nur wer sich wandelt, bleibt mit mir verwandt. O longing of youth that misunderstood itself! Only he who changes remains akin to me. Oh Lebens Mittag! Zweite Jugendzeit! Unruhig Glück im Stehn und Spähn und Warten! Der neuen Freunde! Kommt! 's ist Zeit! 's ist Zeit! O noon of life! Second time of youth! Restless happiness in standing, watching and waiting! New friends! Come! It's time! It's time! Freund Zarathustra kam, der Gast der Gäste! Friend Zarathustra has come, the guest of guests! Fünf Ohrenund kein Ton darin! Die Welt ward stumm ... Five earsand no sound in them!